«©NCSX» Tachikoma generally garners love whenever a new toy is released. 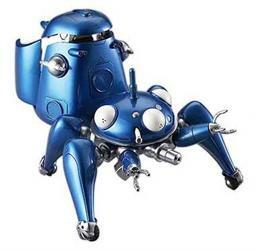 Megahouse tests the level of affection in the marketplace with a new 1/20 scale Tachikoma which measures roughly 13cm tall and is crafted from ABS plastic. Metallic paint is used for the body to give the Tachikoma a shimmering sheen that is bound to catch the eye of collectors and woodland animals alike. Features on the Tachikoma include rolling wheels under the legs, properly formed gun turrets, a pod which opens up to unveil the winsome Motoko Kusanagi inside, and pincers that are molded to look like the pincers we know and love from GITS. Accessories included inside the package include a wrench for Motoko to use, a gunmetal-colored gunpod, and an open book replica so the Major has something to read.